On our first trip to NYC, Craig and I decided to visit the NHL Store in New York City. 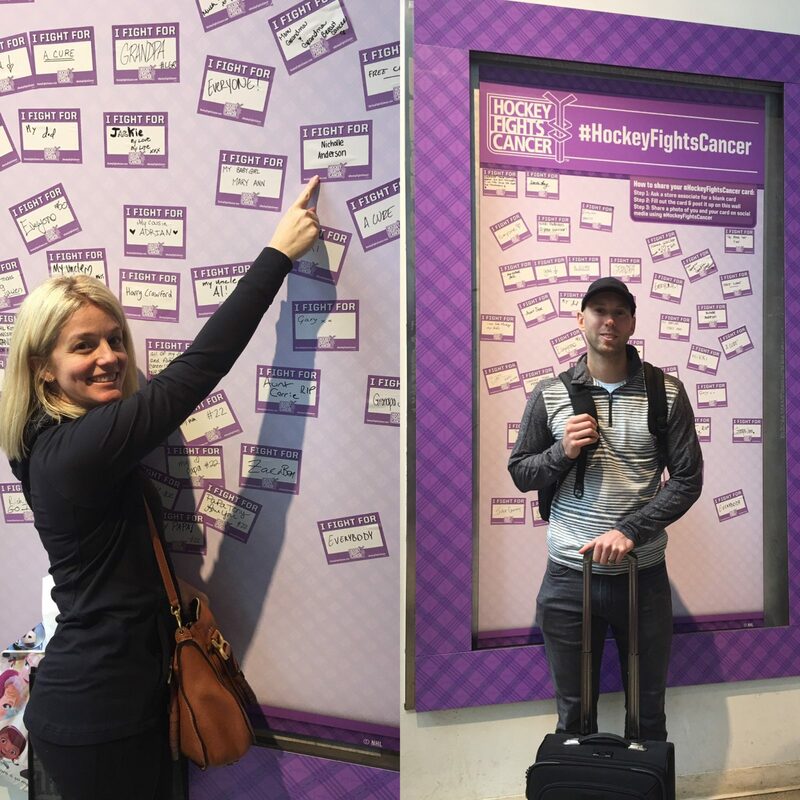 After all the tremendous support we received, we noticed on Twitter that someone put my name up on the Hockey Fights Cancer board at the NHL Store. Even though it might not be a memory you want to remember, it was touching to think strangers are rooting for you. Thank you everyone for your continued support. We can’t thank you enough! Love you guys!!! Stay strong! You and your family are in our thoughts. Our family wishes you a speedy recovery. Stay strong! Many are holding you hand through this journey, silently, but thoughts and prayers are all around you! In the cocilpmated world we live in, it’s good to find simple solutions. An amazing young lady you are, attitude is a great percentage of your recovery, hugs to all. You have a whole city rooting for you, Nichole. We love you and Craig. Such a blessing! Love you guys…. Thinking of you & your Family at this time. Positive attitude will carry you through. May God bless you & keep you in the palm of his hand. All the best Nic. I’m a fan of Craig and a cancer patient. Will be watching your progress and giving you a virtual hug. The very best of success to you in this great fight. You will win! Wishing you well. Stay positive and beat it. My prayers are with you and your wonderful family. Stay strong, we are all praying for you and all those who are fighting. Each day is a day closer to getting over the bump in the road. Thinking of you and sending positives vibes to you. You will meet some absolutely amazing medical staff on your journey as I did in Ottawa. Stay strong and keep the faith. God is with you and I pray every drop of chemo has God healing power!! I beat cancer at a young age and so will you. You have so much support and a positive attitude. Very inspirational.